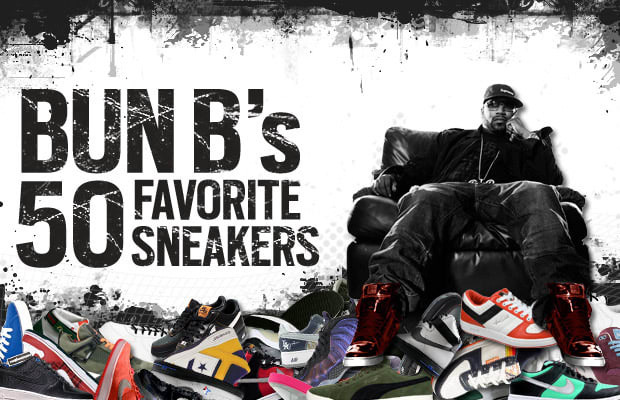 Like his rap career, Bun B&apos;s sneaker game is no joke. Whether it&apos;s getting exclusive Jordans and Air Force 1s early, designing his own sneakers for brands like Greedy Genius and PRO-Keds, or being a member of the exclusive ATF crew, Bun&apos;s name is always in the mix of celebs who rock heat. Did we mention he&apos;s designed one of the best Nike Bespokes to come out of 21 Mercer? Recently, we sifted through pictures on the Internet to compile Bun&apos;s Greatest Footwear Moments, but this time around we sat down with the Houston legend to get his mega-list of his 50 Favorite Sneakers direct from the source. What took top billing? You&apos;re going to have to click for that. Start the countdown below, and then save the date for Bun&apos;s new album, Trill O.G., which hit stores August 3.